November 2011 is shaping up to be quite a memorable month of reading! To begin, it is the inaugural year for Picture Book Month. The daily posts from authors and illustrators have been very inspiring. My family once again made pancakes while reading Nate the Great to celebrate Marjorie Weinman Sharmat's birthday on November 12. Secondly, we discovered that Marc Simont, the illustrator of many books in the series, also celebrates a November birthday which gave us an excuse to read Nate the Great all month long! Marc Simont, also a well-known political cartoonist, was asked in an interview with WritersCast, which children's book in his amazing 70 year career did he love working on the most. He responded, "Nate the Great is a good series because of the author, Sharmat. She took the staccato language -- way of speaking like a detective -- short sentences which is ideal for that age group. They want to get involved and lose themselves. I was very fortunate in doing those. They have sold very well." 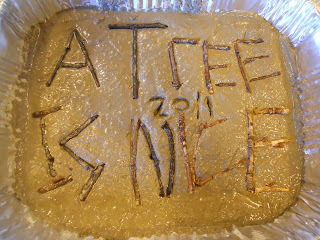 A tree is nice to plant. You dig the biggest hole you can and put the little tree in. 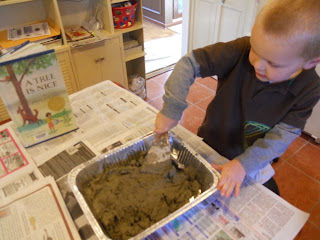 Then you pour in lots of water and then the dirt. You hang the shovel back in the garage. Every day for years and YEARS you watch the little tree grow. You say to people, "I planted that tree." This reminded me of a sapling that my son found, a few weeks ago, in a flower bed in the front yard. He thought it was strange that is was growing there. I suggested that we transplant it in the backyard. 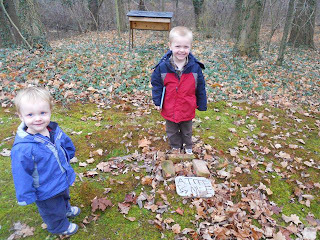 We placed bricks around it to protect it from the lawn mower. However, it was certainly missing something. Something to let everyone know that it was an important tree -- one that we planted. 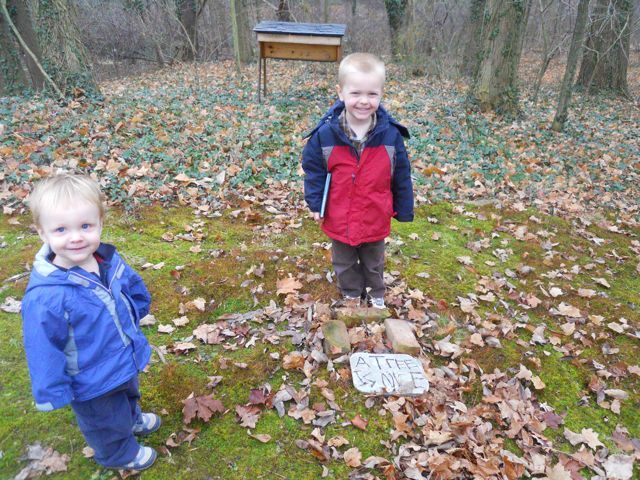 We decided to find a way to let everyone know this tree was special to us. 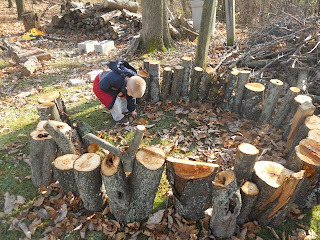 My son gathered sticks from the backyard and he found quite a few in his fort. 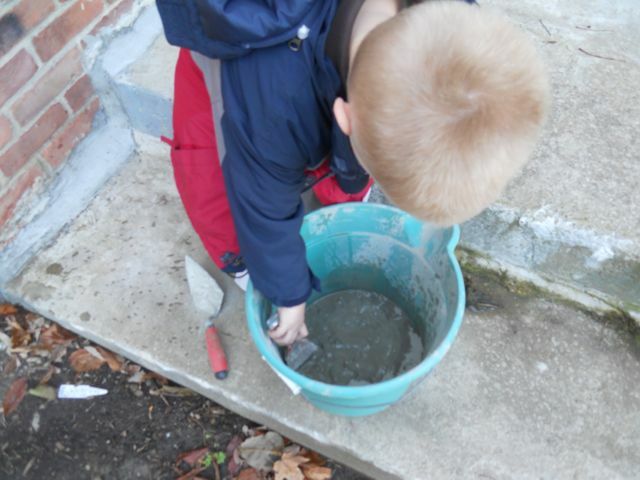 We then mixed some concrete in a bucket. It was chilly outside so we took our project inside. 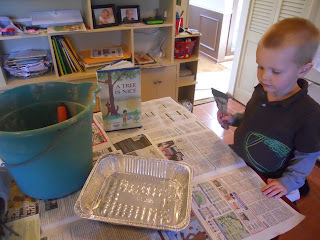 We covered the kitchen counter with newspaper and readied a rectangular baking tin. 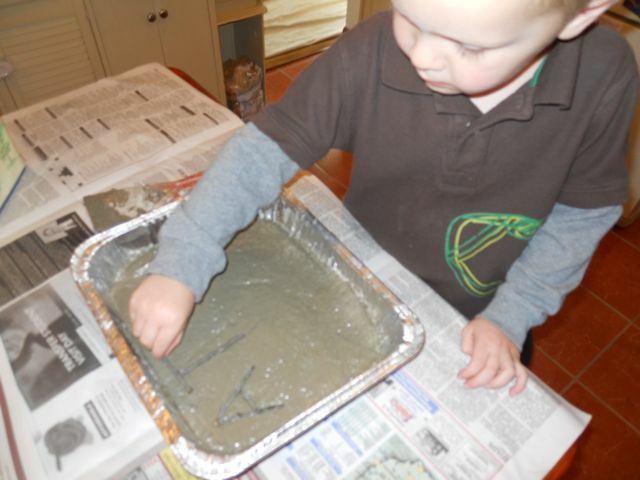 My son evenly spread the concrete throughout the tin. I broke the sticks that he gathered into small pieces. Then, my son formed letters by pushing sticks into the concrete. He used the book cover as a guide. He said when I handed him one stick to make the letter I, "I need two more small sticks for the top and bottom of the I." 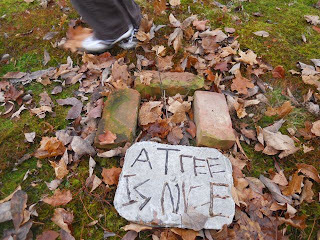 Once the sticks were in place we added the year in which we planted our tree. I used a stick to make the 2 - 0 and he used a butter knife for the 1-1. 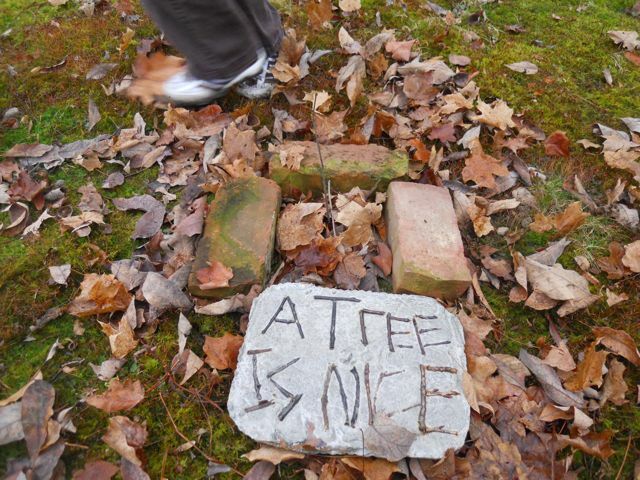 The concrete hardened overnight and we took our tree marker to our special tree. We read A Tree is Nice as we blew into our frozen hands before my son headed off to preschool. We looked up as we read the first line of the book, "Trees are very nice. They fill up the sky." We are so thankful for our trees in our backyard. I wish all of you a Happy Thanksgiving! I am very thankful for everyone that has supported me in the making of this blog over the past year. The positive comments really keep me going. Enjoy your time with your family this week. Your purchases on Amazon.com for Holidays can benefit Happy Birthday Author! Just click on the advertisement below or use the search bar in the upper left hand corner. Thank you so much!